This article is intended as an educational resource, not to give or replace any medical, legal, or psychiatric intervention that is needed. If you or someone you know is in crisis please call 911 or the National Suicide Prevention Lifeline at 1-800-273-8255. It’s difficult to be 100 percent prepared for an employee mental health crisis. Mental health is nothing if not unpredictable, and sometimes, a major incident can happen without any warning signs, leaving staff and coworkers asking themselves what they could have done differently. That being said, it IS possible for companies to gain a deeper understanding of mental health and to examine their corporate culture and practices to ensure they’re providing support. According to the National Alliance on Mental Illness (NAMI), a mental health crisis is “any situation in which a person’s behavior puts them at risk of hurting themselves or others and/or prevents them from being able to care for themselves or function effectively in the community.” How this crisis manifests can range from the colloquially-named “nervous breakdown” all the way to the employee harming themselves or others. How do things get to that point? There is no one answer, as it depends on the employee’s individual state of mental health, (or their diagnosis, if they’ve been receiving mental health treatment), and situational factors. Someone suffering from severe depression, for example, may feel unrelenting emotional pain, hopelessness, and/or a sense of worthlessness that tells them that everybody would be happier without them around. If the mental health issue is going untreated, if treatment is ongoing but no improvements are detected, or if the employee is self-medicating with drugs or alcohol, the employee is at an increased risk of being overtaken by their mental illness and turning to suicide. Obviously, no responsible employer wants any employee to suffer this way. Instead of simply leaving it up to employees to manage their mental health alone, companies can offer support in two ways: creating a culture that supports good mental health, and having a comprehensive plan in place to handle any mental health crises. How Is Your Company Managing Mental Health? Many companies might think they have a fairly supportive culture in place and that they’re reasonably prepared for a mental health crisis. But are they? Considering the stakes, companies need to take this topic seriously and invest the time and effort to effectively support employee mental health. Mettie Spiess, Global Workplace Mental Well-being Expert and Founder & CEO of A World Without Suicide, agrees, stressing the importance of corporate culture and how it relates to mental health issues. “All too often, workplace wellness and safety programs focus almost exclusively on physical wellness, which in a way stigmatizes mental health, sending a message to employees that their mental health is not as important as their physical health. Treating both areas of health equally is an essential step toward building a workplace culture where seeking support is non-stigmatized,” urges Mettie. To get started on any needed improvements, companies don’t have to go it alone. Whether they need to improve work-life balance, bolster their focus on mental wellness, or develop a mental health crisis plan, expert resources are only a few clicks away. The first place to which employers should turn? Their employee assistance plan (EAP). EAPs are not only an excellent resource for employees suffering from mental health issues, they can also connect employers to a wealth of resources on how to better support mental health in the workplace, and how to manage a mental health crisis. Mettie also adds the important tip of ensuring that there is more than one way to access support. If someone hates talking on the phone (and there are plenty of people out there who do), it’s unreasonable to expect them to dial a 1-800 number when they’re in a crisis. Online chat, text messaging, or in-person services may be a more comfortable avenue for many employees, making them more likely to seek and obtain the help they need. It’s important to note that by making these resources readily available and free of stigma, employers are providing multi-fold support to their employees. Not only are they helping employees who are experiencing (or who may experience) a mental health crisis, they’re also providing readily available support for that employee’s coworkers who are affected. Make no mistake: If an employee is in a mental health crisis, the rest of the staff will not be unaffected and will need resources and support to process their emotions, especially if the crisis was particularly traumatic in scope (for example, if an employee dies of suicide at work). As employers, we always hope that our employees will enjoy good health and are deeply concerned when we see a staffer struggling with mental health issues or experiencing a full-blown crisis. 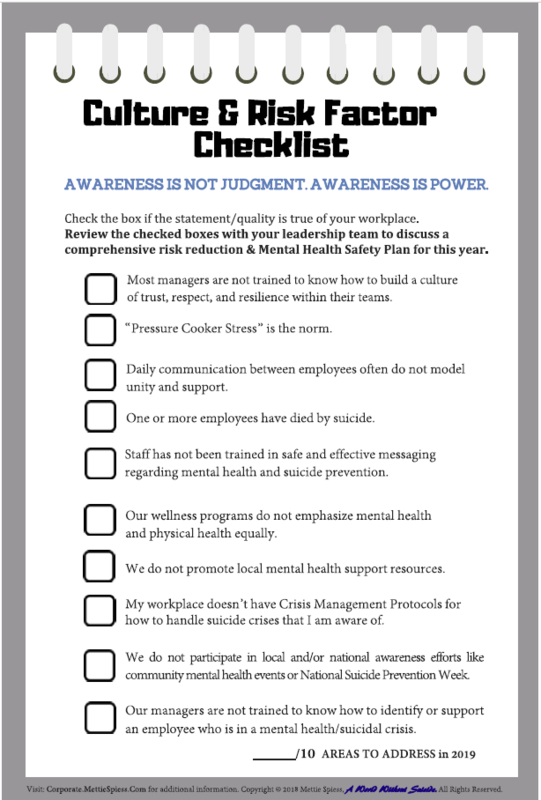 While there is no way to completely prevent a traumatic or distressing incident, companies can and should make sure that their culture, wellness programming, and emergency planning focuses heavily on mental health. By doing so, they can create a workplace that supports mental and emotional wellness while also being prepared to work through any worst-case scenarios.